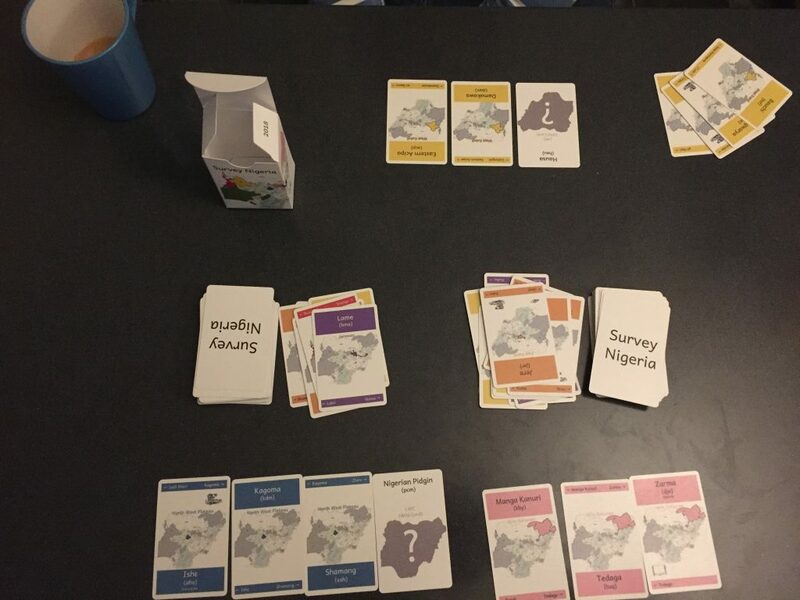 Survey Nigeria is a rummy-style card game for 2 to 12 players featuring over 100 languages of Nigeria. Win the game by collecting languages in their families. Shuffle the cards. Deal each player 7 random language cards. Place the rest of the cards face-down in 1 or 2 ‘draw’ piles. Turn over a card face up from the draw pile to make a ‘discard’ pile. 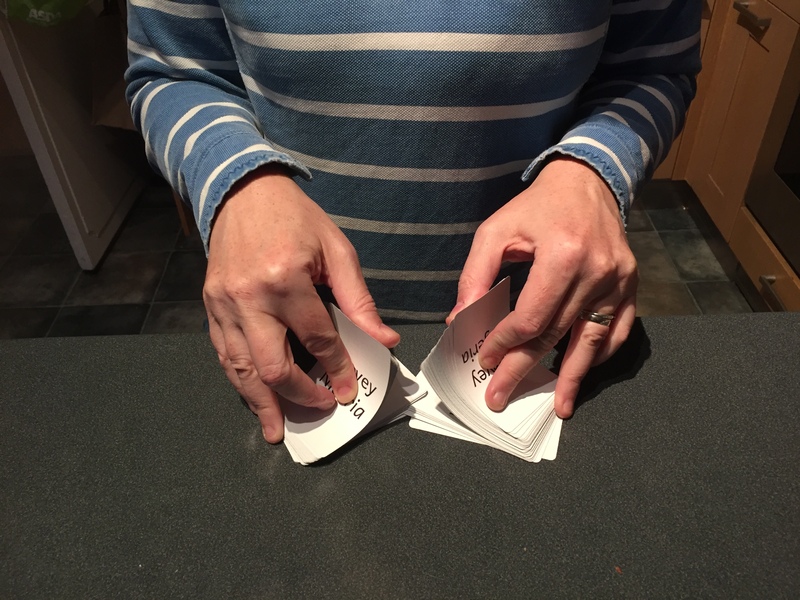 Pick the top card from the face-down or face-up piles. Begin a run: lay down 3 or more languages from the same family. Add a card to a family group already laid down. Discard a card face-up to any discard pile. When a player discards their final card they win the round. 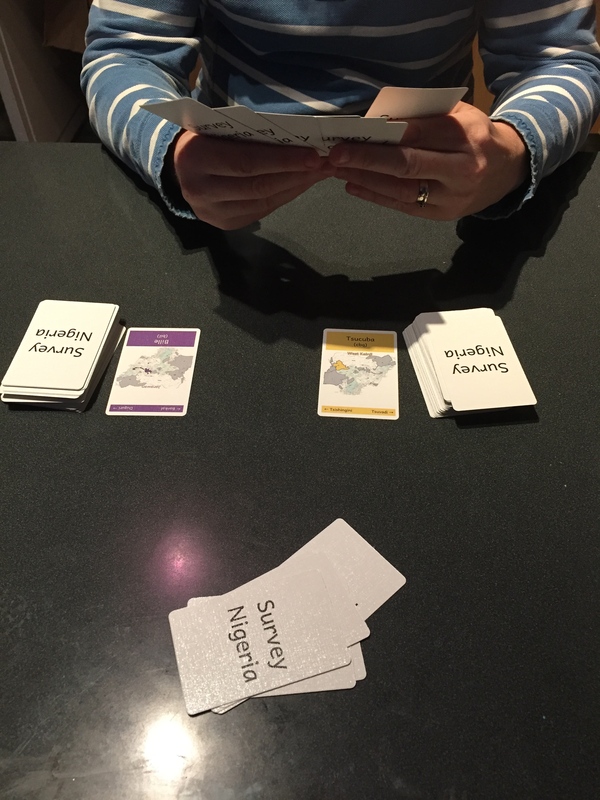 Each language card belongs in a family (indicated by the colour on the card and the map location) in alphabetical order. The ß previous language and à next language are indicated on the top or bottom of each language card. In the full version of the game you can only place cards down in strict sequence. Some language families are much bigger than others! See the SIL Nigeria Language map or Ethnologue.com to find out more. Three kinds of special cards add a twist to the game. Five wild cards represent languages of wider communication (LWCs). Use a wild card in place of any language. If you have the specific language card a wild card represents, you can claim the wild card to use as you wish. 5 Activity Cards include Linguistics, Literacy, Translation, Publications & Scripture Engagement. A player holding 4 activity cards immediately wins the round. Language researchers Roger Blench or David Crozier. A player with 3 activity cards + 1 researcher immediately wins the round. Given the large number of language cards it’s annoying when a card you wanted disappears in the discard piles. Try one discard pile per player or per 2 players to give more opportunities to pick up cards other players discard. Shuffle the discard piles and make a new draw pile. This very rarely happens! When someone scores more than 50 (or a limit you agree) they leave the game. The language name is in large print, with the unique 3 letter ISO 639-3/ethnologue.com code after it. The language family groups related languages together and the location of the language family is marked on the map of Nigeria. Icons show where work is in progress and what of the Bible has been published. ɛ, e̱ is the ‘e’ in get vs gate. u is like oo and i like ee. c is like English ‘ch’. Nigerian languages use tone more than stress, yet most don’t distinguish low/high in writing so it’s impossible for non-native speakers to get it right. Acute is high so Áhán is high tone for both vowels.